Dubai’s latest waterfront destination The Pointe is set to transport guests to the streets of China with their Chinese New Year festivities this weekend – and it’s all free to attend. The new waterfront destination is promising guests ‘an authentic Chinese atmosphere and exciting festive-themed activities’ over two fun-filled days of festivities. Taking place on Friday February 1 and Saturday February 2, there will be an array of live entertainment, pop-ups and even Dragon Boat races to enjoy – all while soaking up the atmosphere of the stunning views out across the water and towards Atlantis The Palm. 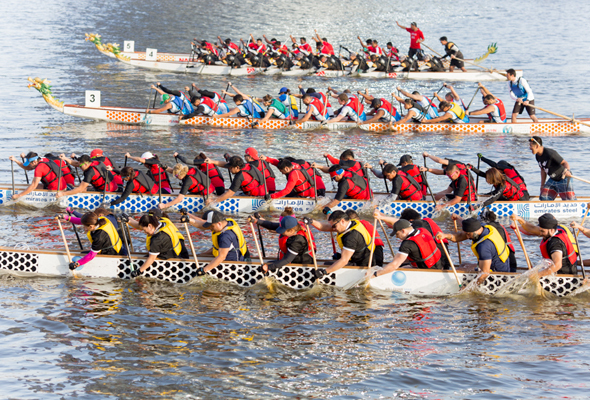 Dragon Boat races will take place on both days between 8am to 6pm, where more than 50 Dragon Boat teams will take the to the waters by The Pointe to compete in an array of formats, including a 500 m challenge for competitive teams and a 200 m competition for amateurs. Entertainment-wise, guests can expect fun for all the family from 4pm to 11pm each day, with a number of Chinese-themed attractions including a Dragon Show, traditional lion dances, face-changing performances, drummers and giant mascots all set to delight visitors. While you’re there, why not check out the ever-growing list of tasty new restaurants at The Pointe, which include Seafood Kitchen, Fitzroy and Asian District. And if you can’t make it on the weekend, you can enjoy a dazzling fireworks display at Atlantis, The Palm from The Pointe on Tuesday February 4 at 8pm. Chinese New Year marks the beginning of the Chinese Spring Festival and lasts for around 23 days. In China, fireworks mark the start of the festival, heralding peace, prosperity and good health.